ALL FEATURES AND DATA ARE PROVIDED "AS IS" WITH NO WARRANTIES OF ANY KIND. SURRY COUNTY, VIRGINIA AND CONCISE SYSTEMS, LLC EXPRESSLY DISCLAIM ANY AND ALL WARRANTIES OF ANY TYPE, EXPRESS OR IMPLIED AND INCLUDING, BUT NOT LIMITED TO ANY WARRANTY REGARDING THE ACCURACY OF THE DATA, MERCHANTABILITY, OR FITNESS FOR A PARTICULAR PURPOSE. BY ENTERING THE SITE YOU AGREE WITH THIS AND ANY OTHER DISCLAIMERS AS MAY BE FOUND ON OR THROUGH THIS SITE. ALL DATA ON THIS SITE ARE FOR GENERAL REFERENCE ONLY. WHEN RESEARCHING REAL ESTATE, THE OFFICIAL RECORDS IN THE OFFICE OF THE COMMISSIONER OF THE REVENUE REMAIN THE AUTHORITATIVE SOURCE. 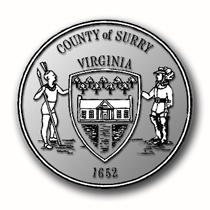 BY USING THE SURRY COUNTY REAL ESTATE SYSTEM, YOU ASSUME ALL RISKS ASSOCIATED WITH THE USE OF THIS SITE INCLUDING ANY RISK TO YOUR COMPUTER, SOFTWARE, OR DATA BEING DAMAGED BY ANY VIRUS, SOFTWARE, OR ANY OTHER FILE THAT MIGHT BE TRANSMITTED OR ACTIVATED VIA A SURRY COUNTY OR CONCISE SYSTEMS, LLC WEB PAGE OR YOUR ACCESS TO IT. NEITHER SURRY COUNTY NOR CONCISE SYSTEMS, LLC SHALL BE LIABLE FOR ANY SPECIAL, INCIDENTAL, OR CONSEQUENTIAL DAMAGES, INCLUDING, WITHOUT LIMITATION, LOST REVENUES, OR LOST PROFITS, RESULTING FROM THE USE OR MISUSE OF THE INFORMATION CONTAINED IN THE SURRY COUNTY REAL ESTATE WEB PAGES. Transfers, will, plats, etc. recorded at the Surry County Courthouse after January 1st of each year will not be updated in the online real estate records until the following year. If you need any current information or have any questions, please call the Commissioner of the Revenue’s office at (757)294-5225.